Sailors highlighted the excellent conditions of wind and sea at the end of the second day of the 17th Edition of the Canary Islands Sailing Olympic Week, in which the sailors of the Real Club Nautico de Gran Canaria Onán Barreiros/Juan Curbelo in 470, and Ángel Granda, in RS:X 8.5, are still unbeatable. 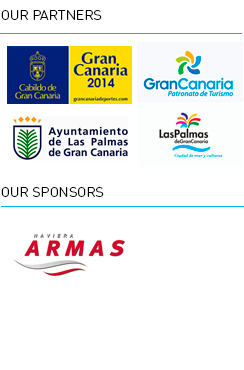 124 crews from 24 countries participate until Tuesday in the most important sailing event of the Canary Islands, a classic winter organized by the Real Club Nautico de Gran Canaria with the support of the City of Las Palmas and the Cabildo de Gran Canaria. Canary Islands Sailing Olympic Week paves the “Sail in Winter”, an international winter programme that combines training and competitions taking advantage of the goodness of the islands’ climate and the exceptional conditions of the bay to the practice of sailing. This season ends with the Laser EuroMaster Series 2016, an appointment that the proximity of the Olympics gives special relevance. Joaquin Blanco, Standard; Onán Barreiros and Juan Curbelo, 470, and Ángel Granda, junior RS:X, all members of the host club together with Hungarian Maria Erdi are the provisional leaders in Laser Radial; Helge and Christian Sach the Germans in F-18; Finnish Oskari Muhonen, Laser Radial Men and the Portuguese Joao Rodriguez in RSX 9.5. About 12 knots with peaks of 15 have provided a great day of sailing on the second day in which the sailor of RCNGC Ángel Granda continues its full partial victories in the RSX class 8.5.